One of the cool new features of Flash Player 10 is that you can load files from the client without uploading them to the server. The only limitation is that you`ll only be able to access the raw bytes of the file and there is no way to find out the filepath (see problem discussion here). The problem is that until now we cannot pass mp3 bytes to the sound object or the netstream class so there is no easy way to play mp3s locally on the client (without first uploading them to the server). So here is a solution that uses the old trick of generating a SWF file in memory which contains the mp3 associated with a linkageId. Note that some mp3s might not work as the Mp3Reader class is not very optimized but it should show the general steps to chieve the goal. Let me know if it`s useful and if you could make any enhancements. Next we`ll look into how to load two mp3s and mix them and save them as a wav (PCM) file. I just did a little experiment with AIR and Papervision. This app grabs all the overview thumbs from Parleys.com, saves them together with the corresponding tags in a local database and lets you search through them. It also generates checkboxes for each tag so you can filter them. 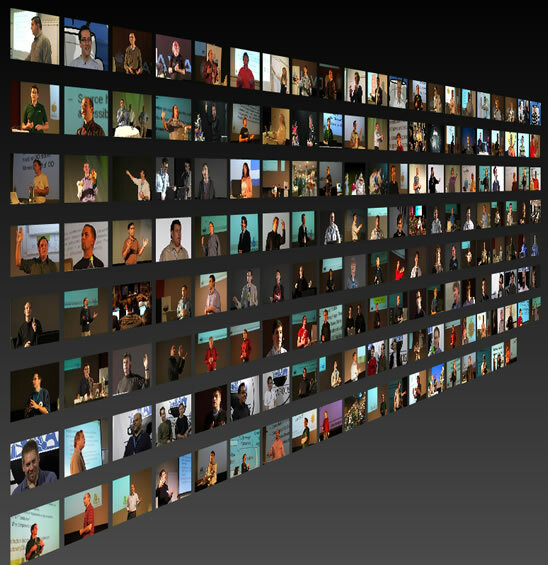 The search result is visualized with papervision. It´s really fun to type and see all the items fly around and rearrange. I only have a screencast here for now but I plan to release a simpler version with source soon. I used Ying to record this screencast so the fps is a bit low but believe me it`s super smooth in reality. What I learned from this experiment? – AIR Sqlite support roocks! – Flash Player performance roooocks! Just updated RichFLV for Air 1.0 and introduced some minor feature updates. This was requested for a long time. You can now edit the onMetaData. For now you can simply add or delete custom key/value pairs. 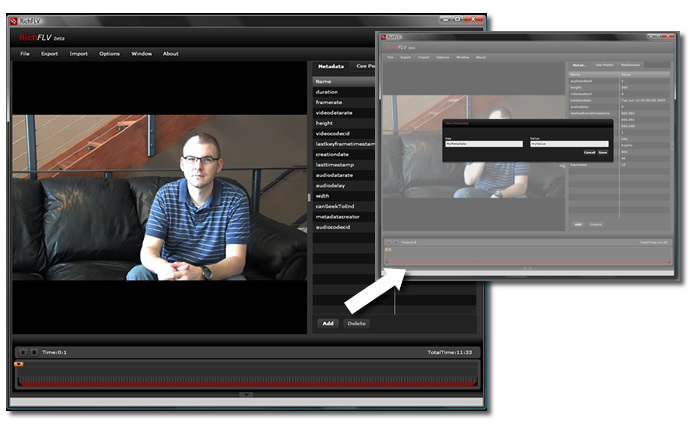 You can now set the In and outpoints directly on keyframes. 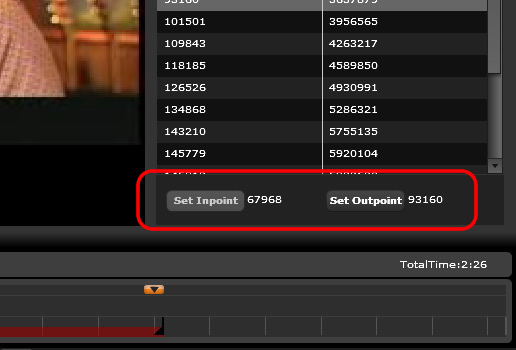 Select a keyframe in the keyframe tab and click on the Set Inpoint/Set Outpoint buttons. version 2 which is completely different but this may take a while. In the meantime you can check out this video to see what`s coming. I`m working with Cairngorm in nearly all of my projects and I like it because it somehow forces me to work structured. But there are some things that I don`t like or don`t get. For example sequencing of Commands in Cairngorm is done by subclassing SequenceEvent and putting all the logic for which event comes next directly into the Command itself. By doing so the command looses a lot of reusability. What if I want to use the same command outside of a sequence chain? I would have to code two commands – one for the sequence and one that lives on it`s own. The other thing is that when i fire a cairngorm event from my view i have no way to know when the corresponding command is done. Only way would be through some sort of state variables in my model that keep track of the process. I believe that this approach is quite fragile because sometimes you might have to commands of the same instance running and you`ll never know which of same changed your model. And a model with hundreds of state variables just doesn`t look clean to me. I lived with all these problems for some time know and never really thought about forking the original cairngorm framework because I like to work with the original framework to be safe for future changes. But now I just can`t live with these problems anymore – so here is my first try into improving this stuff. … not really 😉 but it`s impressive how far one can get in a few hours. 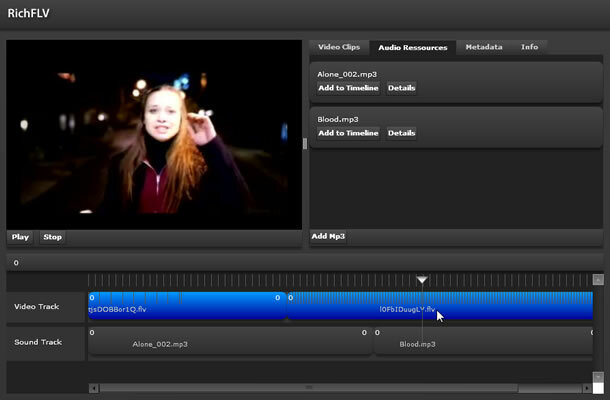 In this new version it`s now possible to edit multiple flv files and multiple mp3 files and combine them to one flv. The binary stuff works pretty well but my main problem is the internal preview. It`s really difficult (impossible???) to play flvs and audio files and synchronize them. So the solution for now is that everytime one clip is cut or the audio changes i create a new flv file in memory with all the changes applied and load that back into the preview. Sure this takes some seconds and gets harder the bigger the files are but still it`s not that bad and you`ll get 100% accuracy.